DiY skills may one day turn a tinkering hobby into life-saving knowledge. Turning book knowledge into useful stuff takes initiative. Below you’ll find a slew (33 counts as a slew, right?) 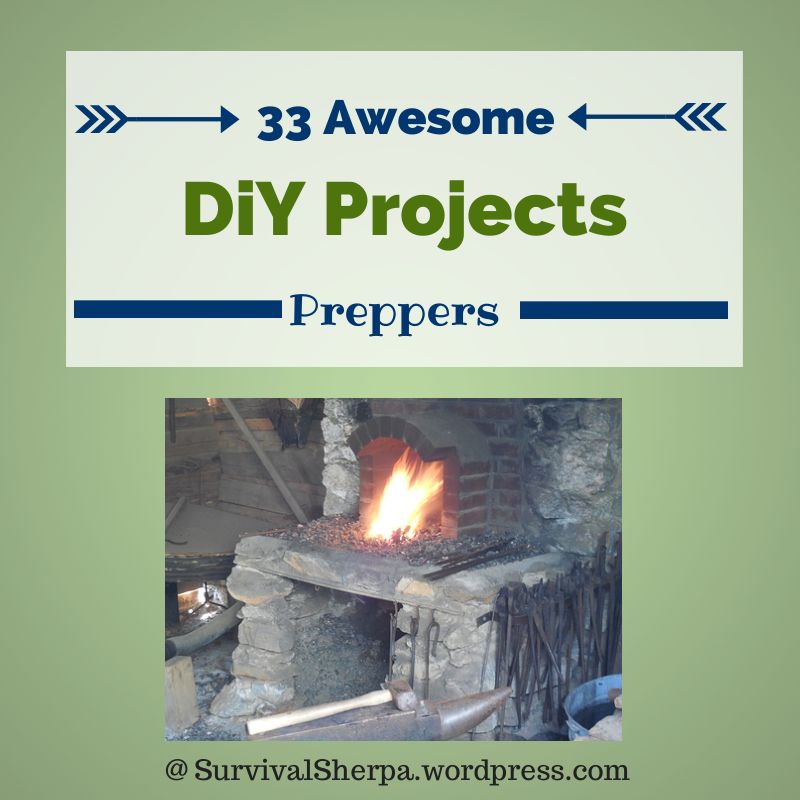 of ideas to help you on your journey to self-reliance and preparedness. Most will take only a few minutes and minimal skills. Others require hours and sweat equity. Doers of the Stuff don’t mind. It’s just what we do. I know y’all have more to add to this list. Drop us a line about your DiY projects and ideas in the comments (with links if you have them) and add value to our community! P.S. – You can also keep up with the Stuff we’re Doing on Twitter, Pinterest, Google +, YouTube and Facebook page… and over at the Doing the Stuff Network on Pinterest, Google +, and Facebook. Copyright Information: Content on this site (unless the work of a third-party) may be shared freely in digital form, in part or whole, for non-commercial use with a link back to this site crediting the author. If you are interested a third-party article, please contact the author directly for republishing information. What a great list! Thanks for putting this together! I think I want to try learning to make my own deodorant! Jamie, the deodorant is so easy to make. And there’s no aluminum in it 🙂 BTW, my stats are saying lots of people are digging your Rocket Stove link. Great article! Thanks for sharing Todd. Maybe the 😉 face helped! That’s one of my favorite posts. Milk of Magnesia straight out of the bottle. My mom learned it from Dr. Oz. then I researched it. Apparently, it really works for BO. Good read– I reblogged!!! Thank you!!!!!!!! Thanks for this list. Very cool projects to tackle. Thanks Mike! Glad you like them. Thanks for the diy goodies….I enjoyed them very much. 😀 jac, don’t think Dirt Road Girl would be too keen on that idea 😉 So glad to hear from you. Keep doing the stuff! Thanks so much, Will! I appreciate you sharing the stuff! I have done a lot in my lifetime from survival training, to being homeless for 2-years and learning a ton out there as well, and I’ve never found a single person who’s had so much together before. I knew about the Hobo Stove, I could tell the stories of how it saved my life out there on the streets several times from literally dying. Today I prepare for whatever is coming next, and studying and learning everything I can to make sure I’m ready for that too… I just can’t get over how you’ve changed my opinion of some things with your posts, I am recommending to everyone I know to come read your stuff, truly a wonderful find of information, please keep up the great work. Wow, Compton! Thanks for your response and comment! Two years of homeless living will most definitely teach you survival skills. I was ‘homeless’ for only four months once in my life. I lived in a homeless shelter by choice. That one experience taught me a lot about myself and others people. I’d be so appreciative if you’d contact me via email to discuss your homeless years. I think your experience would add so much value to the preparedness community and people in general. survivalsherpa at gmail dot com. Again, I’m humbled by your comments. Keep doing the stuff, Compton! I see many sites and this one today topped many of them with resource information on just one page. I really like to gain some great knowledge without much hassle and I saw that here. Great work and thanks again!! When I saw your name this morning I thought I knew you. You’re a legend on Pinterest in the self-sufficiency arena! Just followed the rest of your boards. Thanks for your encouraging words, Ed! Great list of DIY projects. I see a ton of really fun projects to work on with my kids. Keep up the great work! Glad you found our stuff useful! Teaching kids self-reliance skills is an awesome undertaking. 😀 Thanks for you comment! Thanks, Mike! Glad you stopped by. Can you use coconut oil instead of suet for the pemmican? Might taste better and yet be another way to get your recommended dose.